The world’s only plant bracket competition, Shrub Madness®, has come to a close for 2018 and a champion has emerged. Based on the college basketball playoffs, the contest is populated with a wide variety of Proven Winners® ColorChoice® shrubs, which compete throughout the month of March for the chance to be crowned National Champion. After a month of voting, Zinfin Doll® Hydrangea paniculata has been crowned the 2018 Shrub Madness National Champion. Coming from a crowded field of 64 contenders, the competition narrowed to the Floral Four, and then the final two after multiple rounds of voting. This year’s Floral Four included Pugster® Amethyst Buddleia, Let’s Dance® Blue Jangles® Hydrangea macrophylla, Czechmark Trilogy™ Weigela, and champion, Zinfin Doll® Hydrangea paniculata. The match started out neck-and-neck in the final round of voting, but Zinfin Doll® hydrangea built a steady lead, defeating its tri-colored challenger, Czechmark Trilogy™ Weigela. A record number of votes were cast in this year's competition. Shrub Madness is the brainchild of the marketing department at Spring Meadow Nursery, developers of the Proven Winners® ColorChoice® brand of shrubs. Developed five years ago, Shrub Madness is one example of how Proven Winners® puts its marketing dollars to work to bring attention to its plants, and as a result, bring garden centers more business. But that's not the only benefit the plant bracket competition brings to the party. "Shrub Madness is excellent market research." said Spring Meadow marketing specialist Shannon Downey, "It's an effective way to find out first-hand what customers respond to and what they’ll be looking for when planting season begins...it’s an inside look at what they want and need in their yards this season." This type of research is useful because it gives the company an opportunity to challenge internal preconceived notions about which plants might be most popular with the public. The additional information that is gained as a result of the contest helps to inform marketing decisions going forward. When asked if the contest seems to be gaining traction with the gardening and plant-expert community, Spring Meadow marketing specialist and horticulturist Stacey Hirvela said, "This has been a fantastic year for Shrub Madness. We ended up just shy of 275,000 votes and had over 7,000 people register. That's a 207% increase in votes and 196% increase in registered Shrub Madness website users. While everyone in the (Spring Meadow) marketing department puts lot of time, effort, and of course, love, into Shrub Madness, there’s simply no better, more cost-effective way to advertise so many plants." She continued, "All things considered, we accomplish more engagement with our plants and our brand with this contest than we do with anything else." Introduced to garden centers in 2016, Zinfin Doll® panicle hydrangea certainly looks like a champion with loads of beautiful, dense blooms that emerge pure white, and then turn bright pink from the bottom up as the season progresses. The blooms then age to a dark red-pink in the fall. 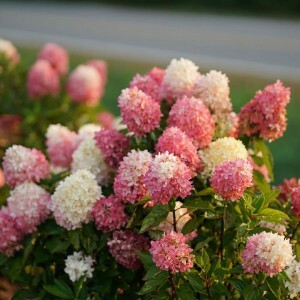 Zinfin Doll® hydrangea's large, unique blooms, held up on strong stems and the plant’s overall exceptional hardiness make this plant a stand out and propelled it to victory in the 2018 Shrub Madness competition. This year Shrub Madness players were once again given several opportunities to score dozens of prizes. At the end of each round, samples of top-scoring plants were awarded to participants and the player with the bracket prediction closest to the tournament’s results was awarded the grand prize “Floral Four and Plant Geek Swag Bag.” The list of winners can be found on the Shrub Madness website, www.ShrubMadness.com.